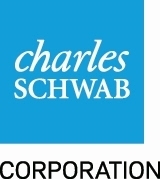 SAN FRANCISCO--(BUSINESS WIRE)--The Charles Schwab Corporation announced today that its net income for the fourth quarter of 2016 was a record $522 million, up 4% from $503 million for the prior quarter, and up 25% from $416 million for the fourth quarter of 2015. Net income for the twelve months ended December 31, 2016 was $1.9 billion, up 31% year-over-year. (1) Net litigation proceeds include $57 million in the fourth quarter of 2015, and $16 million and $75 million in full-year 2016 and 2015, respectively, relating to the company’s non-agency residential mortgage-backed securities (RMBS) portfolio, which are included in Other revenue. (2) Net tax benefits include $15 million in the fourth quarter of 2015 and $29 million for the full year, relating to certain current and prior-year matters, which are included in Taxes on income. New retail brokerage accounts for the quarter totaled approximately 182,000, up 21% year-over-year; total accounts were 7.1 million, up 3% year-over-year. Held financial planning conversations with approximately 32,000 clients during the quarter, up 10% year-over-year. Approximately 132,000 planning conversations were held in 2016, up 18% from the prior year. Opened two company branches in Brookfield, WI and Aspen, CO and opened two independent branches in Gainesville, FL and Peoria, IL. Schwab has over 335 branches across the country that offer clients access to a range of investing and personal finance guidance, services, and products. Graduated the second class of FC Academy, a 24-month development rotational program preparing recent college graduates for a career in one of our branch offices. Graduated the second class of FC University, a 10-week onboarding program that prepares new hires to be successful at Schwab and supports the expansion of our branch network. Launched “Investing Principles” on schwab.com that outline Schwab’s core beliefs and approach to investing. Divided into three key components – Identify Your Goals, Get Invested, and Stay on Track – they create a foundation for every client, no matter where they are on their investing journey. Announced enhancements to Institutional Intelligent Portfolios®, the automated investment management platform designed for independent advisors. The primary update is enhanced portfolio customization, which provides advisors greater flexibility to design portfolios based on their investment philosophies. Announced enhancements to Schwab Advisor Center, the custody and trading platform for independent advisors. The platform now offers an array of automation features and tools, along with online support, enabling advisors and their clients to reduce paperwork and complexity. Hosted over 5,100 advisors, exhibitors, sponsors, and media at our IMPACT® conference – the largest and longest-running annual gathering of independent registered investment advisors. This year, Schwab executives and industry leaders focused on growth, cybersecurity, and talent. Launched a series of client experience, risk management, and efficiency improvements including two-way text fraud alerts for debit cards, online joint Schwab Bank High Yield Investor Checking® account opening, paperless Schwab Bank High Yield Investor Saving® statements, and paperless 1099-INT statements. 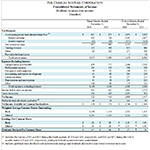 Balance sheet assets = $175.7 billion, up 26% year-over-year. Outstanding mortgage and home equity loans = $11.5 billion, up 4% year-over-year. Pledged Asset Line® balances = $3.9 billion, up 22% year-over-year. Schwab Bank High Yield Investor Checking accounts = 914,000, with $13.8 billion in balances. Client assets managed by Windhaven® totaled $9.0 billion, down 24% from the fourth quarter of 2015. Client assets managed by ThomasPartners® totaled $10.2 billion, up 40% from the fourth quarter of 2015. Client assets managed by Intelligent Portfolios (Schwab Intelligent Portfolios® and Institutional Intelligent Portfolios®) totaled $12.3 billion, up $2.1 billion from the third quarter of 2016. * For more information about Schwab Target Index Funds and Schwab ETFs, see csimfunds.com. The company also announced today that it has scheduled a Business Update for institutional investors on Thursday, February 2, 2017. This Update is designed to help the investment community keep abreast of recent developments and management’s strategic focus. The program is scheduled to run from approximately 8:30 a.m. - 12:15 p.m. PT, 11:30 a.m. - 3:15 p.m. ET. Participants will include members of the company’s executive management. A simultaneous webcast of this Update will be accessible to the public at http://schwabevents.com/corporation. This press release contains forward-looking statements relating to client value and investing experience; growth in the client base and client assets; financial performance; business growth; revenue growth; improved profitability; expense discipline; balance sheet management; growth initiatives; optimizing the spread earned on client cash; target range for common stock dividends; investing for profitable growth; sharing the benefits of scale with clients; and building long-term stockholder value. Achievement of these expectations and objectives is subject to risks and uncertainties that could cause actual results to differ materially from the expressed expectations. Important factors that may cause such differences include, but are not limited to, the company’s ability to develop and launch new products, services and capabilities in a timely and successful manner; the company’s ability to attract and retain clients and registered investment advisors and grow those relationships and client assets; general market conditions, including the level of interest rates, equity valuations and trading activity; competitive pressures on rates and fees; client use of the company’s advisory solutions and other products and services; the level of client assets, including cash balances; the company’s ability to manage expenses; capital needs and management; the company’s ability to monetize client assets; the timing, amount and impact of bulk transfers; the quality of the company’s balance sheet assets; client sensitivity to interest rates; regulatory guidance; the effect of adverse developments in litigation or regulatory matters and the extent of any charges associated with legal matters; any adverse impact of financial reform legislation and related regulations; and other factors set forth in the company’s most recent reports on Form 10-K and Form 10-Q. 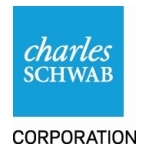 The Charles Schwab Corporation (NYSE:SCHW) is a leading provider of financial services, with more than 335 offices and 10.2 million active brokerage accounts, 1.5 million corporate retirement plan participants, 1.1 million banking accounts, and $2.78 trillion in client assets as of December 31, 2016. Through its operating subsidiaries, the company provides a full range of wealth management, securities brokerage, banking, money management, custody, and financial advisory services to individual investors and independent investment advisors. Its broker-dealer subsidiary, Charles Schwab & Co., Inc. (member SIPC, http://www.sipc.org), and affiliates offer a complete range of investment services and products including an extensive selection of mutual funds; financial planning and investment advice; retirement plan and equity compensation plan services; referrals to independent fee-based investment advisors; and custodial, operational and trading support for independent, fee-based investment advisors through Schwab Advisor Services. Its banking subsidiary, Charles Schwab Bank (member FDIC and an Equal Housing Lender), provides banking and lending services and products. More information is available at www.schwab.com and www.aboutschwab.com. (1) Includes fee waivers of $31 and $153 during the fourth quarters of 2016 and 2015, respectively, and $224 and $672 during the twelve months ended 2016 and 2015, respectively, relating to Schwab-sponsored money market funds. (3) Certain prior-period amounts have been reclassified to conform to the 2016 presentation. (4) Adjusted for the retrospective adoption of Accounting Standards Update 2015-03, which decreased long-term debt and total interest-bearing liabilities by an immaterial amount. (2) Advice solutions include managed portfolios, specialized strategies, and customized investment advice. Fee-based advice solutions include Schwab Private Client, Schwab Managed Portfolios, Managed Account Select®, Schwab Advisor Network®, Windhaven® Strategies, ThomasPartners® Dividend Growth Strategy, and Schwab Index Advantage® advised retirement plan balances. Intelligent Portfolios include Schwab Intelligent Portfolios®, launched in March 2015, and Institutional Intelligent Portfolios®, launched in June 2015. Legacy Non-Fee advice solutions include superseded programs such as Schwab Advisor Source and certain retirement plan balances. Average client assets for advice solutions may also include the asset balances contained in the mutual fund and/or ETF categories listed above. (1) Includes proprietary equity and bond funds and ETFs held on and off the Schwab platform. As of December 31, 2016, off-platform equity and bond funds and ETFs were $7.8 billion and $12.7 billion, respectively. (3) Second quarter of 2016 includes an inflow of $2.7 billion from a mutual fund clearing services client. Fourth quarter of 2015 includes an inflow of $10.2 billion from a mutual fund clearing services client.